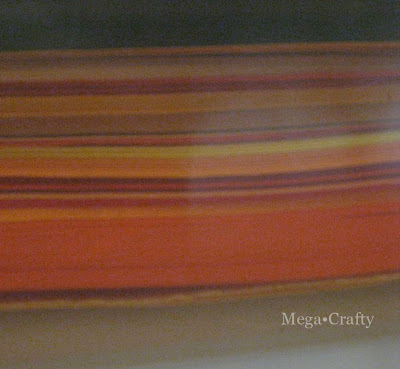 Mega•Crafty: My Tour Of My Studio- Part 1 organization. My Tour Of My Studio- Part 1 organization. I swear I haven't been slacking off on the craft front this week. I've just been cleaning my disaster area of a studio. 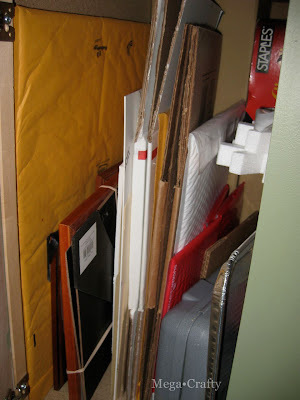 But a great thing happened during this process- I realized that I have a pretty good organizational backbone going on in there (I'm just missing the "put things away" gene). 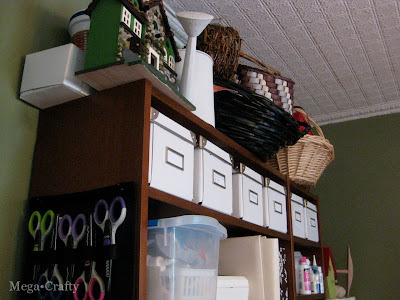 So I thought I could share some of the things I do to organize my materials (which ideally keeps you from making a mess but in my case it helps me clean up my mess relatively quickly) in case any of you are looking to do an "organizational makeover" in your craft space. As I continue to neaten up this week and next I'm going to show you a few other areas- And I'm fully aware that I've said this before when I've posted bits and pieces of a prior studio cleanup- sad fact is I never get it "clean enough" there's always another project that creates a mess it seems but I really am determined this time! A few years ago I did an "organizational makeover" of my studio. First thing I tackled was to increase my storage space. The room that my studio is in already had a built in bookshelf which I thought was perfect, but it soon became clear that it just wasn't enough space. The built-in was stuffed to capacity and materials were still strewn everywhere with no place to go. I bought these inexpensive book shelves which more than doubled my previous storage capacity. The most frequently used materials live on these shelves (since it's closer to my main work area than the build-in) and I just love how easy everything is to grab when I need it. 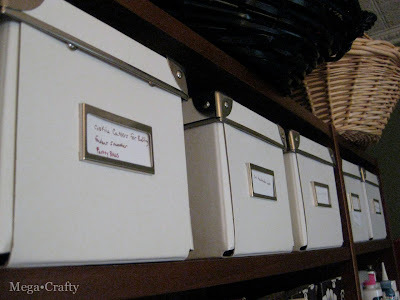 Mostly I have clear storage containers filling the shelves that are organized by type of material. I label the containers but honestly it helps way more to see what's in there. 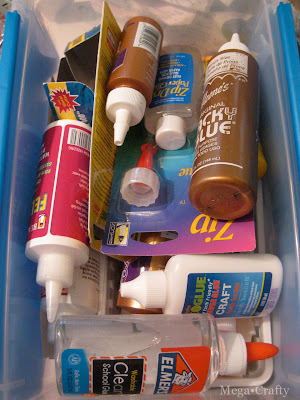 All the regular glues are in one place. 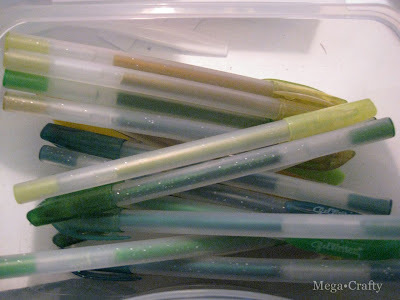 Hot glue guns and sticks are in a separate container. Both containers are stacked right on top of each other. 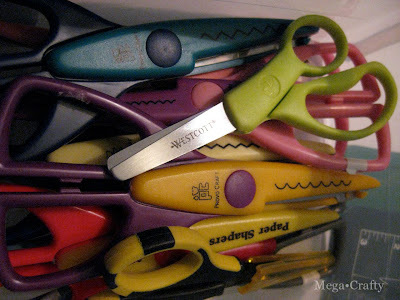 Here's extra scissors of various types (I don't think you can never really have enough- especially if you have friends over to play... I mean craft). 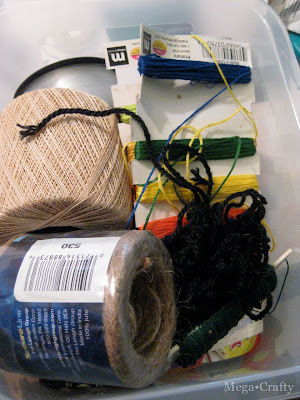 I have pretty much everything in containers like this- Strings and wire are in one, all the glitter in another- you get the idea. There are some materials that I deal with a little more specifically. In these cases I try to consider my usage habits. 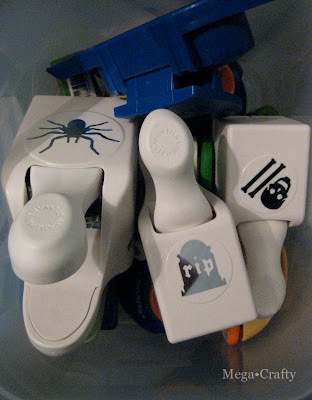 Since I have quite a few paper punches (and they are pretty heavy when you try to pile them into one container) I have multiple containers- each organized by type of punch. Sets or ones I always use together are kept in the same bins (here are all my snowflakes and flowers of various sizes). 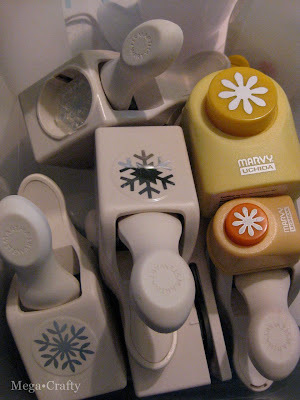 All holiday specific punches get their own container. All markers and pens and colored pencils are in the same spot on the shelf. The sharpies are in mason jars (easy to find and grab what I need, plus they look pretty out on the counter when in use). The Bic set came in a great holder so I left that in tact. 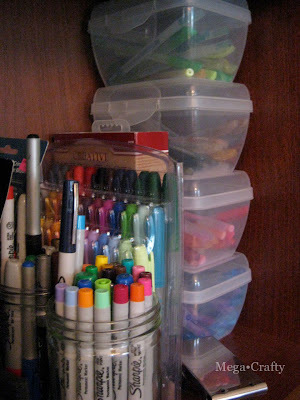 My gel pens are separated again by color groups (since I always search thru them by color looking for the perfect shade) and put into really small containers that I can stack in the corner of a shelf. 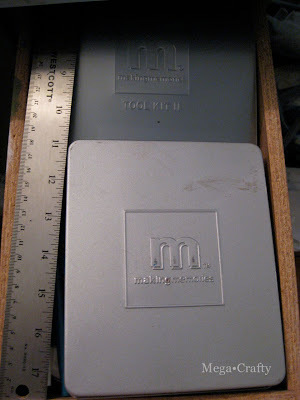 I have these boxes on the top shelves for infrequently used materials. With these materials it's not so important to me that I can see into the container without opening it. 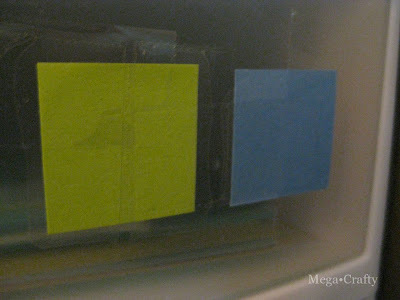 Similar items are stored together and contents are label on the outside of the box. Magazines are sorted by title into these boxes and kept in chronological order. I'd like to say I go back and look through them but truth is I could get rid of almost all of these as I never end up looking back thru them. Make use of typically unused surfaces. I've stored baskets and other bulky items on top of the shelving units. It's a great spot for them because I don't need them often and they are out of the way. But when I do want one I can see exactly what I have a grab it fast. The side of the bookshelf proved to be an opportunity for storage too. I had this great set of decorative scissors that came in their own pouch. Hanging it on the side of the bookshelf both made the scissors super easy to see/use but also took up virtually no extra space. If there is one thing I absolutely love and am thankful for almost everyday it's how I've organized my paper. I made just one modification to these. I really wanted to be able to slide an entire drawer out of the tower and take to my work surface to rummage through. 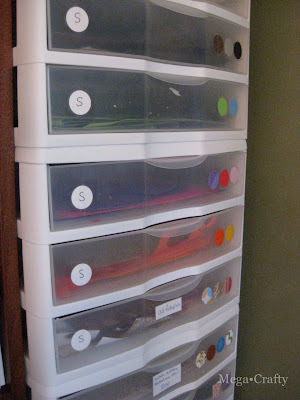 So The Mister carefully clipped off the plastic tabs that held each drawer into the tower and viola- perfect! It's quick to find what I need, neat... and let's just face it- a tower of paper is like a dream to someone that loves paper as much as I do! The paper is separated out in a few ways- First is it a scrap or a full sheet. The top half of the tower is all my scrap paper, each of those drawers is designated with an "S". Most of the time I don't need a full sheet so I wanted my scraps easily reachable. When I first decided to organize the paper I found I had a ton of almost full sheets of paper with one little corner cut off or 1 paper punched shape missing. It used to be so hard to find what I needed that I would just grab the first sheet I could find of the color I wanted and never look to see if a scrap piece would do just as well. I wasted a lot of paper that way. Then it's organized by color grouping. Yellows and Oranges, Blues, Greens, Pinks and Reds, Browns and Blacks, White Ecru and Beiges. 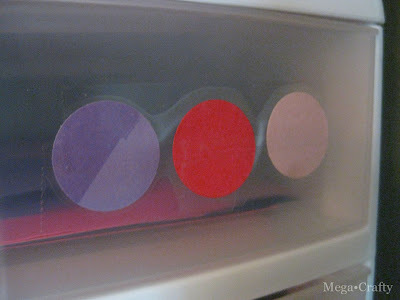 The color groups for each drawer get put onto the front for easy visual reference. 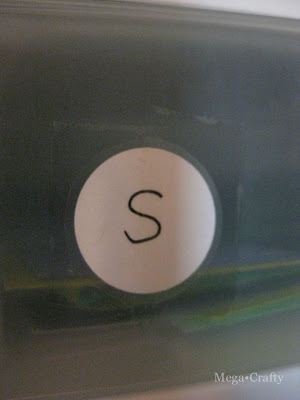 And just incase I missed the "S" label, if the paper is scrap the drawers and marked with circles- full sheets get marked with squares. Patterns and Metallics were dealt with a bit differently, they are still separated out by scrap or full sheet but then they are organized them by the type of pattern instead of color. The drawers still get the round/"S" and square labels. 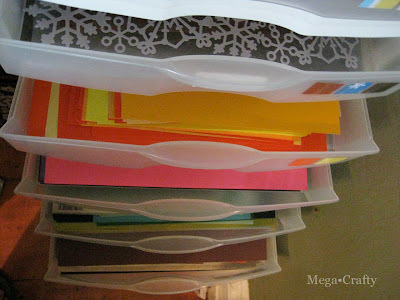 So in total I have a scrap drawer and a full sheet drawer for every color or pattern grouping. I can't even tell you what a difference this has made in my paper usage! Under surface storage is ideal. Under my main work surface (a counter height island) I have cabinets and drawers, which are filled with materials like frames, envelopes, styrofoam, moss, gourds, a box of mason jars and tons of other things. I even keep specialty baking pans that I don't use often in here so I don't clutter up the kitchen cabinets. 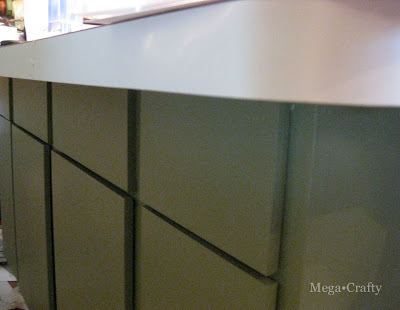 I also have a smaller counter height surface with cabinet space underneath. This cabinet was salvaged from an old kitchen and is much smaller than my large island. 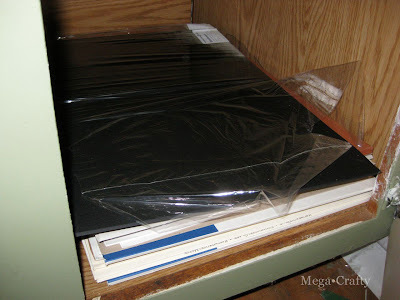 It had drawers inside which turned out to be the perfect place to keep oversized paper (11x17 and up). I have some pictures on the walls but I also left room for wreath materials. These were hard to store anywhere else so I figured if they were met to hang why not store them hanging on the walls. Ribbons, a work in progress! 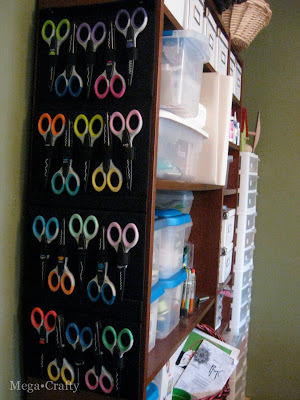 I thought I solved my ribbon storage problem with The Mister made me this ribbon holder. 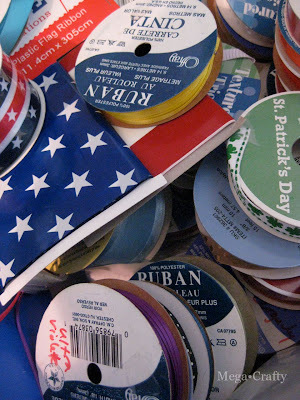 But what I've found is that I have waaaay more spools than space. For now the overflow is in a storage container but no matter how many times I organize it (by color and holiday) they wind up getting all mixed up. 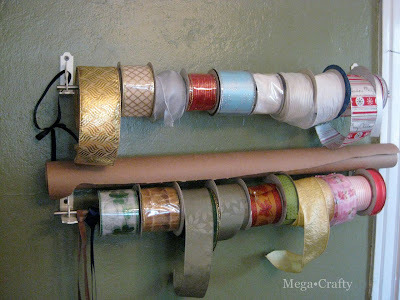 If any of you have a good ribbon solutions I'd love to hear it! P.S. The mister read this post and said it makes me look a little crazy especially the paper part... but I'm pretty sure I gave him fair warning about this before we got married! No, not crazy. I am going home to show my husband. He will be impressed. Now, the junk I have messy and unorganized ALL over my house, now...that is crazy!!!!!!! Thanks for taking the time to leave a comment Jennifer! Even with the studio... I have craft things strewn about my dining room table. Sadly- containing the craft chaos to just one room might not be possible. It's great to see your ideas! The ribbons are hard. I don't have as many as you, but we simply keep them in clementine boxes. I don't save magazines anymore. I don't read many anymore! 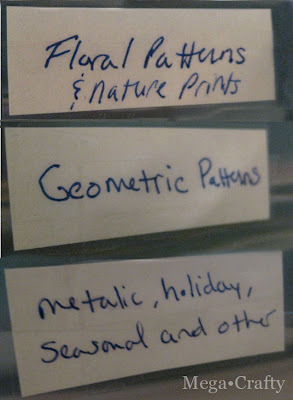 I rip out the items/patterns that interest me and they go into binders for sewing projects, knitting and kid's crafts. 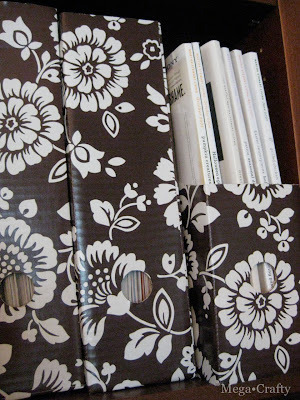 Oh I really like the binder idea for magazines! I keep them because there are a few things I love and want to have from every issue but... I never ever look through them. But I think I'd flip through I binder and look at a collection of "best of's" from a number of issues. And I'd gain a ton of shelf space by getting rid of the full issues. I'm rather jealous of your collection of sharpies! I'm always looking for my black one, perhaps if I actually organised my room I'd be able to find it! Hi Jaz, thanks for leaving a comment. I definitely have a thing for permanent markers- LOL. Why is it always- always the black marker that goes missing? !